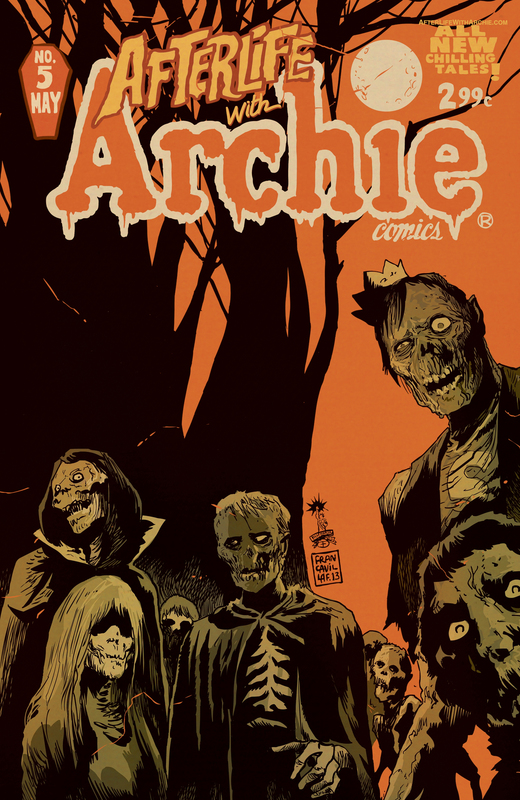 The Hollywood Reporter exclusively unveiled the Francesco Francavilla cover for Afterlife With Archie #5, which was then followed by Comic Book Resources’ debut of the Andrew Pepoy variant for the same issue. Escape from Riverdale, Part 5 [of 5]: The do or die moment has arrived! With Lodge Manor under siege by flesh-eating zombies, and the rest of Riverdale in flames, the surviving members of our beloved gang must make a fateful decision: Do they stay in the only home they’ve ever known, or take their (slim) chances in the outside world? And if they go, where will they go? And does that mean they leave their undead pals ‘n gals behind forever? The most earth-shattering decisions will be made in Riverdale history in the newest installment of this TEEN + series! Definitely NOT for all ages!